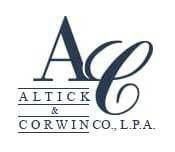 "Sound advice and exceptional legal services since 1853" is not just a slogan for the attorneys at Altick & Corwin - it is the cornerstone upon which we were built, and it continues to be the guiding principle of our practice. We take a proactive approach to solving client problems and are committed to providing the highest quality legal counsel at a cost-effective price. Because we truly value the relationships we have established with our clients, we endeavor to always exceed their expectations through uncommon caring and personal attention. Our strong commitment to the entire Miami Valley community is built on the diversity and dedication of our attorneys and staff. This commitment is clearly demonstrated through our active participation in many community, government and philanthropic endeavors. In addition, a number of our attorneys serve as board members on various non-profit, corporate and municipal organizations. Each attorney has concentrated skills and experience in one or more specific areas of law. There is substantial synergy among the attorneys and we are able to offer highly focused advice and counsel, in addition to providing a broad overview for effective planning and informed decision making. We are proud of the broad spectrum of personal and academic backgrounds represented among our attorneys and staff. This diversity enables us to better understand the objectives or challenges of each of our clients, whether corporate or individual. In addition, the staff supporting our attorneys includes experienced and capable legal assistants and legal secretaries, law clerks, paralegals, accounting and support staff. Like our attorneys, the staff is firmly committed to our firm's mission of providing outstanding legal service.